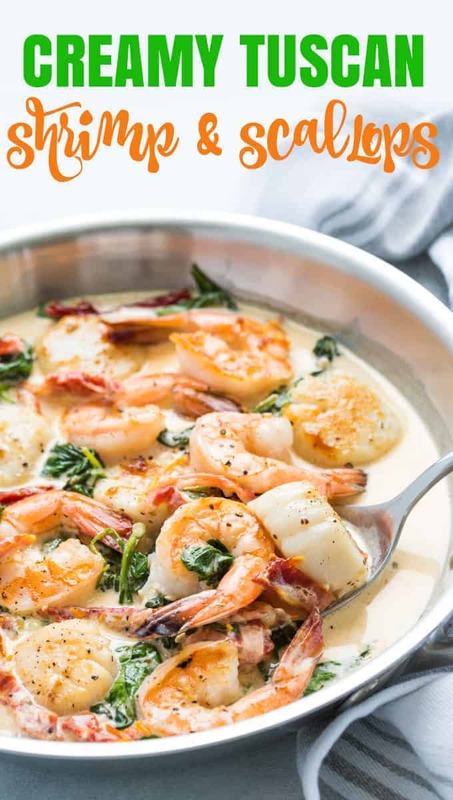 This recipe for Creamy Tuscan Shrimp and Scallops is so quick, easy and sinfully delicious… no one will know you spent just 20 minutes preparing it! Flavor-packed is a total understatement here… this sauce with sun dried tomatoes and spinach is so velvety, savory and creamy. 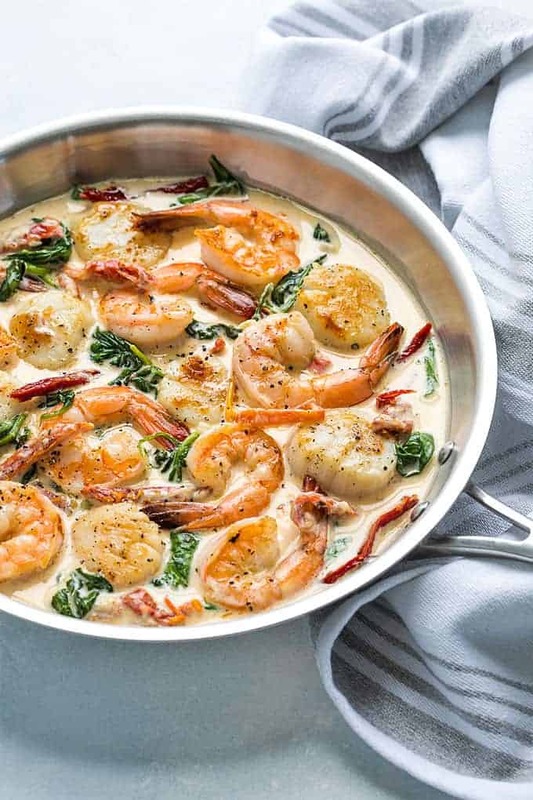 Pair it with sweet shrimp and scallops and seafood night has never been better (or easier!). 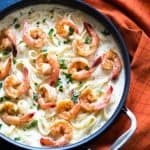 I love it over pasta or by itself with crusty French bread to dip in the cream sauce… so cozy! Rinse shrimp and scallops, pat dry with a paper towel and season with salt and pepper on both sides before cooking. Since shrimp and sea scallops have different cooking times, I cooked them separately. They both cook quickly but shrimp take a little less time to cook than scallops. 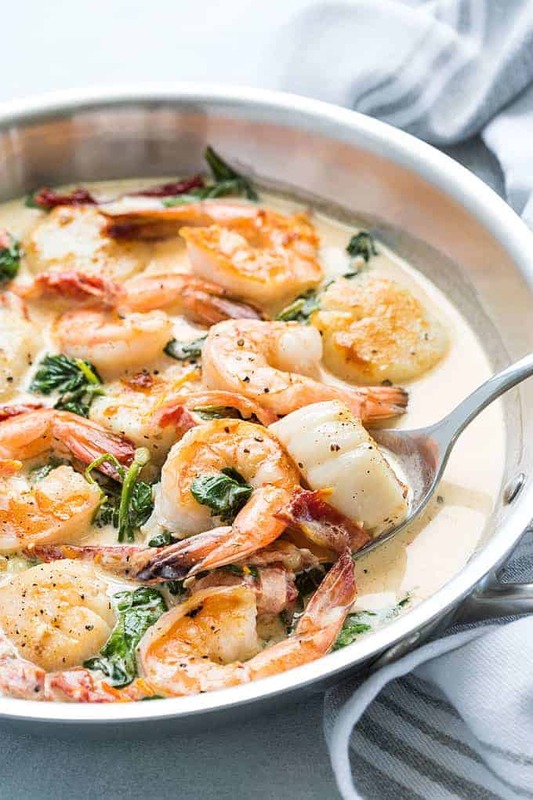 Over-cooking gives shrimp and scallops a tough, rubbery texture. 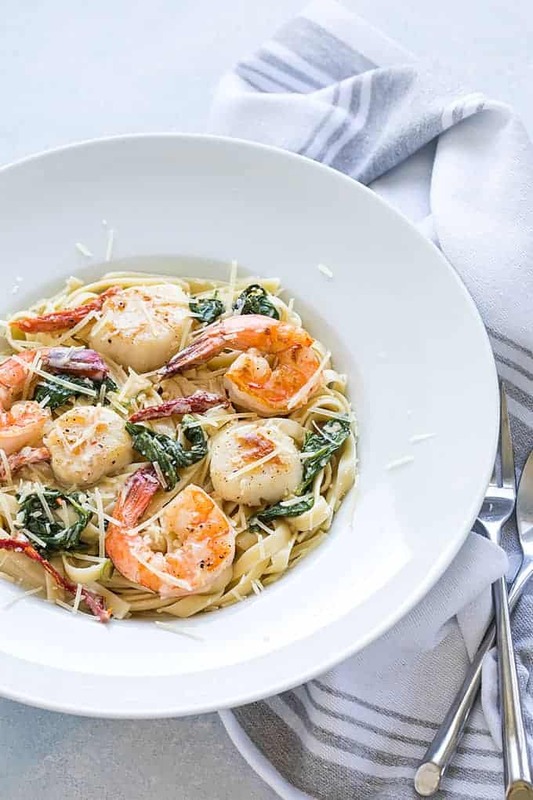 Rinse scallops and shrimp and pat dry with a paper towel. Season both sides with salt and pepper. Heat olive oil in a large skillet over medium high heat. Cook scallops first – Cook scallops on each side for approximately 2-1/2 minutes, or until browned. Transfer to a plate. 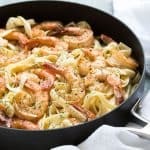 Add more olive oil to the skillet if necessary and cook shrimp – Cook for about 1-1/2 minutes on each side or until shrimp have just turned pink on both sides. Transfer to the plate with the cooked scallops and set aside. Add garlic to skillet and cook until fragrant, stirring constantly (about 30 seconds). Add broth, cream, sun dried tomatoes, Parmesan cheese and Italian seasoning. Stir well to combine. Bring to a boil, reduce heat and simmer 3-4 minutes. Add spinach and continue to simmer until spinach is wilted and sauce is slightly thickened (about 1-2 minutes). 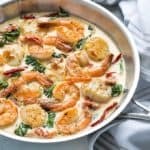 Return shrimp and scallops to skillet and serve topped with cream sauce. Optional: serve over cooked pasta, if desired. I made this and it is SO good!! My family wants it every week! My teenage son is learning to cook and he made this a few nights ago. OMG it is delicious! This was a great recipe even without the sundried tomatoes. It was quick and easy too. I’m making this for a party. What kind of rice could this go with? Could you do it over zoodles? Looks delicious – planing on preparing. 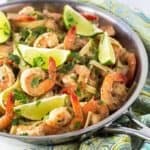 Can any portion of cooking be done ahead? I really like being with guests as much as possible but not in the kitchen. Thank you for a great recipe! Made this for Hubs and I tonight as it is a rare meal we don’t have without a child or two (all adults but still) It was delicious! I did tweak it a little. 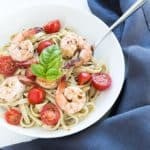 I had no sun dried tomatoes so I drained some petite diced tomatoes, added some capers, fresh parsley and a dash of white wine to the sauce as well as a few tbsp of pasta water. Hubs LOVED this and so did I. Thanks SO much for sharing this recipe. Pretty darn delicious! My husband couldn’t shut up about it and said he would eat it again ANYTIME, so… that about sums it up. Very easy and relatively inexpensive (especially if you look out for some good sale ad deals on the seafood!). Oh, and we’re all STUFFED! That makes my day, Kelly… so happy to hear! 🙂 Thank you! Just made this tonight, my husband insisted i print it out so we would make it again! absolutely delicious, thank you!! Made this recipe and it was simple and very good. Thanks for the notes as well!!! I made this tonight, since it was Friday and we wanted something different for no meat Friday during Lent. It was absolutely delicious. My husband loved it. I followed your recipe to a T and when I tasted the meal I said to myself, that tastes like something you get in a restaurant. .Hahaha!! Thank you so much for your delicious recipe and such clear and easy instructions. 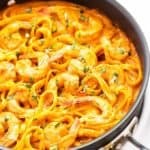 I was looking for a new recipe to try and came across this gem! It was fantastic!